With over 600,000 bowlers in Australia, bowling clubs have become an integral part of Australia's sporting community. In fact lawn bowling is popular with players of all ages, with people realising that bowling is an enjoyable, healthy and affordable sport. Local bowling clubs have been quick to ensure the social side of the game matches the activity. Clubs are favourite meeting places for people from all walks of life to gather in a friendly environment, not only for a game of bowls but to also enjoy the great, low-priced meals and facilities offered. The Australian National Bowling & Lifestyle Magazine is a new full colour, glossy magazine keeping readers updated on what’s happening in bowling clubs and other selected points within Queensland, NSW and South Australia. We believe that Bowls is simply - The sport for life. Welcome to the Summer 2017 issue of Bowling & Lifestyle Magazine. Subscribe to be the first to receive the magazine or gift one to someone special this year. This issue is jam packed with exciting stories, amazing articles, giveaways to musicals/shows, entertainment, health advice & retirement/aging solutions. Relax and unwind this Christmas, this issue has christmas recipes waiting to be cooked and dished out this year all thanks to Dairy Australia, Cashback offers & discount offers thanks to Henselite & Jackies Bowls Shop & much much more. You'll receive 4 issues during a 1 year Australian National Bowling & Lifestyle Magazine magazine subscription. 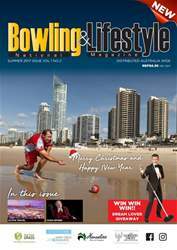 You'll receive 4 issues during a 1 year Australian National Bowling & Lifestyle Magazine magazine print subscription.